Part No: A819101-1 Category: GC-MS Service Parts. Tags: 1 L, 1 litre, A22304199, A46229000, backing, E2M1.5, edwards, edwards vacuum, EMF 20 oil mist filter, exhaust filter, o-ring, odour element, oil, P101438, pump, rotary, roughing pump, rv12, universal gc-ms-kit, vacuum kit. This kromega Edwards vacuum kit provides preventative maintenance of the RV5 and E2M1.5 backing vacuum system. Includes: 1 Litre high grade pump oil, odour element, exhaust filter and o-rings. 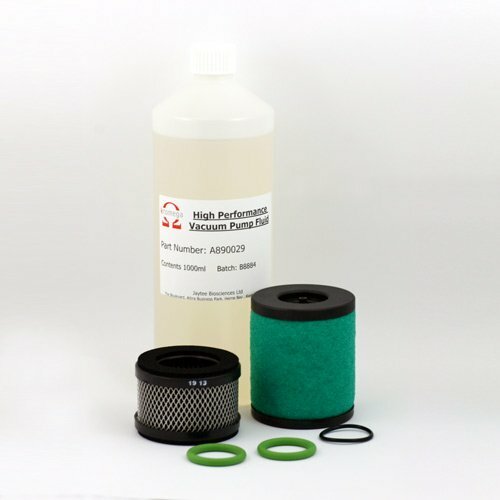 Important note: Is compatible with Edwards EMF 20 oil mist filter only (see picture). For systems using the EMF 10, please use part A809014. NB. One vacuum kit services one pump. Designed specifically for Edwards RV12 and E2M1.5 backing / roughing pumps.